BumbleKing Comics • View topic - Ask Ian for AUG/SEP '08 - Did You Miss It? Ask Ian for AUG/SEP '08 - Did You Miss It? 1) I know you've said their aren't many characters from the games left that you'd bring in, but the fact that you used Honey as an example prompted me to ask this: Are their any chances of the Battle Bird Armada (Battle Kukku Army) appearing in the comic? I know of an article I read a while ago on Sonic HQ saying that they were originally intended to appear, and I would love to know if they've still got a shot. Jet and Predator Hawk's mention of an armada also seems eerily similar. 2) With all the anti-s coming back and getting introduced: Anti-Knuckles coming back soon? 3) With Sonic Unleashed seeming to be the next big Sonic game, it seems odd to me it isn't considered cannon. Is it not cannon because of the real world locations, or is their another reason? 4) You mentioned you want to bring in the other Sonic R doubles, one question: How would you handle Tails Doll? 5) If Omega gets to debut in the future, would he be more likely to debut in StH or SU first? Are you gonna explain how Miles went from wannabe-cool-thug to distinguished looking evil genius? Last edited by snax90 on Fri Sep 26, 2008 7:28 pm, edited 1 time in total. Hi Ian. I have just a few questions for you. I'm new here so yea....big fan. 1) I've noticed that there has been some kind of change in Scourge. How so? Well he acts very differently towards Fiona now than he did before and he is more malevolent now or just more cold. He was a villain before but at least wasn't as cold as he is now. What is going on him? Is he just so into the whole new-evil power conquering villain job now or is this just how Scourge truly is but we just didn't see him like this before? 2) Will we ever go into further detail of the relationship between Scourge and his father or at least get more detail on the mirror event: "The Great piece"? 3)Is it possible that when this zone cop does appear Scourgie will possibly be arrested and have his world somehow sealed off from Mobius? 4)Is Fiona pretending to be on Scourge's side even after all she's seen and she's just playing him by continuing the "bad girl" attitude or is has she really gotten into this whole "bad guy" business like it's her thing? 5)When Sonic and Amy travel to Moebius will we possibly be seeing some of drastic changes Scourge made to his world or are the only changes he mad were actually he his team members and their names? This could be broken down into several different questions, so answer it however you want. Is the Sonic comic as we know it heading towards any sort of climax? As in, you know, coming to an end? Obviously the comic isn't ending any time soon with the introduction of Sonic Universe, but do you feel as if the comic is heading towards a destination storywise? I realize the Sonic comic will probably keep plodding along so long as it's profitable, but you could potentially end the comic in it's current form and create a new comic with a new angle on the same SegaSonic characters. Do you think the Sonic comic we read now will ever reach some sort of resolution, whether it's it's next month or one hundred issues from now, or will kids in twenty years be reading the same Sonic like kids today do with Batman and Superman? And now for the last round of September Q&A. Onward comes October! Also - congrats to a few questioners. You actually posed a few Q's I can't answer - even vaguely - without giving away something major. You stumped the potto. Question #1 wrote: Will we be seeing the regular Sonic X guest artists in SU from time to time? I don't know, honestly, and I'm not sure if I can reveal who will be on each book just yet. I know y'all will be seeing some familiar names, and at least one new one. Question #2 wrote: You said Nichole wouldn't always be aware of whats going on in her city all the time, but isn't the entire city made of nanobots that she is in control of at all times? I always thought she could monitor and control every part of the city 24/7. Conceivably she could, but that's not the issue. It's a question of if she should be monitoring everyone's homes 24/7. It's a question of privacy here. That, and even Nicole has her limits. She might be able to spy on everything on the off-chance some ne'er-do-well sneaks in - or she can keep the power going, or the shield up, or monitor the defenses, etc. Another way of looking at it: your body is brimming with sensory organs and cells. Do you know when an errant bacterium flies up your nose? Question #3 wrote: What issue proved to be the hardest to get from script to final product? I was writing the script for SX#17 - the St. Patrick's Day issue. I got to the page where Chris comments on the rain, and Chuck says something to the effect of: "Well, if our luck holds out, it won't rain." I finished typing the words: "if our luck holds out" - and the power died. A few minutes later, it came back and I'd lost five pages of manuscript. So I re-typed everything and - I'm not kidding - the power died as I typed "if our luck holds out" again. I made a safety-save every panel after that. Question #4 wrote: Hey Ian, out of curiosity, about how long does it take the colorists up there to revamp an archive/select book time-wise? Question #5 wrote: I'm curious about why Lien-Da felt it necessary to go to Robotnik after Enerjak made her and the Legion flesh and blood. Don't they have technical knowledge of their own? And don't have a base where they keep their supplies or a place to return to, a hideout? I only ask because it doesn't seem like Enerjak took away all of their technology. Surely they would have had something to fall back on. Or did I miss something? No, the Dark Legion's forces were pretty battered at that point. Between all their warring with Knuckles and then their losses against the Dingo Regime during the "Year In Space," they were pretty threadbare. I inferred heavy losses since their main tactic during "Return to Angel Island" was "hide." Couple this with the civil war between the Frost and the Flame Legions, and you've got very little to fall back on. On top of all that, not all of the Dark Legion remained. Enerjaknuckles sent some of the thankful Legionnaires to Albion with the Echidnaopolis group (trust me, he says as much, it's in there). So Lien-Da and the DL were looking at severely depleted man-power and resources. There's little chance they could've had all the experienced surgeons they would need, let alone a supply of suitable machinery. Question #6 wrote: About what timeframe when will see Blaze again? Early next year - promise! Question #7 wrote: What happened to the original "Doctor" Robotnik from Moebius (as seen in #11)? I would assume Eggman coming to the prime universe shifted the anti-verse around substantially. Dr. Kintobor is the same Anti-Robotnik of old. He just got much thinner and gave in to King Scourge's "everyone needs a new name" policy. How Dr. Eggman fills the void of a "Robotnik" in the Prime Zone will be touched upon soon. Question #8 wrote: Strange question, but is there a character from the games you do not want to add to the comics? I hate Marine with a burning passion, but she's fun to write, so I give in for the sake of the story. Otherwise, not really, no. Question #9 wrote: Was Sega reluctant at first with Anti-Amy and Kintobor's redesigns? Not that I heard. As far as I know, Sega's been perfectly fine with the Moebians. Question #10 wrote: Are there anti Chaotix and Anti Destructix on Moebius? Presumably. Sadly, there won't be time to investigate them this time around. Question #11 wrote: Assuming the Sonic X ban is lifted, when would you want to characters like Cream from Sonic X to appear (if you plan on using them)? To be wonderfully vague: when the time is right. I don't want to go cramming characters in just because. Question #12 wrote: When will the Black Arms appear on Mobius? Right after they finish killing off the Xorda. Don't hold your breath waiting for that to happen. Question #13 wrote: Is Rotor ever going to fight again or at least get involved more (because it seems like he being side-lined and not liking it)? Rotor was never really much of a field-team member. He's gotten his knuckles dirty, sure, but he's been mostly about support. Part of him is sad to not be a more active member of the team, but that's always been one of his personal hang-ups. Right now he's plenty busy supporting the Freedom Fighters, Chaotix, and helping to run the government. That isn't to say he won't join his friends on the front lines on the rare occasion . . . Question #14 wrote: To take shifts guarding the Master emerald do the Chaotix borrow Knuckles' warp ring? Or do they get there via other methods? Also, when they are not on guard duty, do they remain in New Mobotropolis? Yes, potentially, and pretty much. Question #15 wrote: Is Robotnik's empire still as strong as it was? After all, his capital city is in ruins and on the brink of collapse. The Eggman Empire by itself still has a pretty tight hold on Mobius. Whether or not Robotnik still remains in control is something will be studying more closely after we wrap up "Brave New Moebius." Question #16 wrote: Whatever happened to Mighty's parents? It's pretty vague. Did they just remain in prison? did they die? etc. Sorry, I can't say yet. I hope I'll have time one day to reveal what happened to his family. Question #17 wrote: I know you have no control over character design, but from your perspective is there any reason Mighty and Arlo look so different? Are they just different Armadillo species? There was a big discussion about that very topic a little while back and I ask y'all if Arlo should be "Mighty-tized" or left alone. A lot of good cases were made for and against and how to deal with it; it was a good thread. Ultimately, I think we'll be going with "different breeds" so to speak. Question #18 wrote: Will Bunnie and Antoine be getting more screentime or development? Bunnie and 'Twan have seen huge growth lately - mostly under Karl and Ken and I just followed it to a "conclusion." I'm content with where they are for right now and I'll be focusing on other characters. When the right story or moment comes around, though, we'll be seeing them more. Question #19 wrote: It has been shown that Gamma and Omega have a level of sentience in your opinion is this at a level around M or something near what Nicole has achieved? Excellent question. Not to spoil anything, but if you're patient, I'll be answering you pretty directly in a few months. Question #21 wrote: People have pointed out that Sally has acted hypocritical at times. What is your take on this? Show me a character who hasn't at some point. Everyone has their bad days, and there's always a situation that makes you question, or even double-back on what you normally think is right. Question #23 wrote: Do you think Fiona ever doubts her herself nowadays; like is she pleased being bad or does she feel quilty? Right now she's queen of a planet and living it up with her bad-boy of a boyfriend. She's having too much fun to scrutinize herself right now. Question #24 wrote: Are their any chances of the Battle Bird Armada (Battle Kukku Army) appearing in the comic? I wouldn't rule them out entirely, but I wouldn't stay awake waiting for them at this point. Question #25 wrote: With all the anti-s coming back and getting introduced: Anti-Knuckles coming back soon? Kinda. You'll see, and fairly soon. Question #26 wrote: With Sonic Unleashed seeming to be the next big Sonic game, it seems odd to me it isn't considered cannon. Is it not cannon because of the real world locations, or is their another reason? I can't really say - definitely not right now, and I seriously doubt it later. I can't reveal every inner-working behind the curtain. Question #27 wrote: Are you gonna explain how Miles went from wannabe-cool-thug to distinguished looking evil genius? Think of it as Tails growing up from his starry-eyed side-kick days to talented-inventor-and-full-fledged-Freedom-Fighter. Hyphen! Question #28 wrote: I've noticed that there has been some kind of change in Scourge. How so? Well he acts very differently towards Fiona now than he did before and he is more malevolent now or just more cold. He was a villain before but at least wasn't as cold as he is now. What is going on him? Is he just so into the whole new-evil power conquering villain job now or is this just how Scourge truly is but we just didn't see him like this before? I'm . . . not entirely sure we're thinking about the same Scourge. His attitude adjustment seemed to kick-in after his slight mutation off the Master Emerald. You want cold? He beat Locke unconscious and threatened to kill him. He taunted Sonic getting his emotions torn asunder. He was perfectly fine with Dr. Finitevus's plan to use Enerjak to ravage Mobius. He's always been a pretty nasty guy. Nothing's really changed between him and Fiona either. Pretty much all we've seen up until this moment is the two of them on top of things. 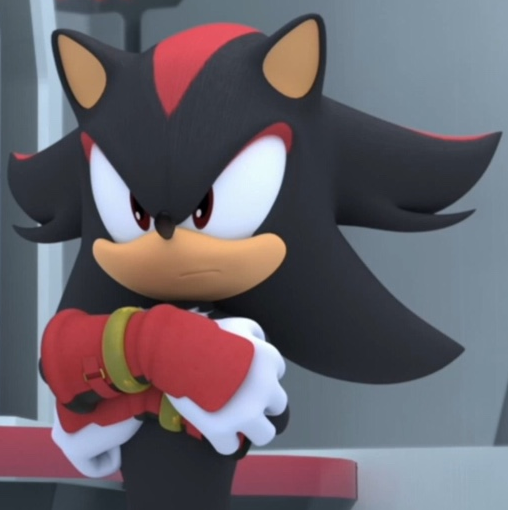 Now that we see Scourge getting roughed up a bit - his plans put on hold or even turned back a little - we see what happens when nasty people are nasty to each other rather than others. Trust me, if/when things turn sour between them, you'll know it. And woe unto anyone in between them at the time. Question #29 wrote: Will we ever go into further detail of the relationship between Scourge and his father or at least get more detail on the mirror event: "The Great piece"? Probably not. Moebian history is a very, very, very low-ranking priority on the book. I put it in there as a fun thing for the old time fans. Savor it. Of course, if I get the chance to go hog-wild on it, you better believe I'll be exploring every facet of Moebius I can. Question #30 wrote: Is the Sonic comic as we know it heading towards any sort of climax? ... Do you think the Sonic comic we read now will ever reach some sort of resolution, whether it's it's next month or one hundred issues from now, or will kids in twenty years be reading the same Sonic like kids today do with Batman and Superman? Short answer: No clue at all, man. Medium answer: I definitely have a few goals / points I want to reach in the narrative and I'm trying to lay the groundwork for them without bogging down myself or any other potential future writer. I think I could come up with a game-plan to end the book, and I'd like to think I can keep coming up with fresh ideas. It could go either way. STH is such an oddity in mainstream comics that it really isn't predictable. By all odds it should've been dead a long time ago, not as successful as it is and certainly not with all the spin-offs it has generated over the years. So I can see the book lasting well on into the 300s just as I can see it suddenly vanishing. It's ultimate fate is impossible to predict. And so I'm not going to. I gave up on that a long time ago. I'm perfectly content to write it for as long as I'm allowed, to do the best job that I can, and to enjoy myself in the process. IF the book were to come up for cancellation, I would like it if we could see it through to a conclusion. But usually when a book goes, it's just gone, and we're all left going "But-but-but....what happened next?!" Ultimately, don't sweat it. Just enjoy what we've got now and get eager for what the previews show coming up next. There's plenty of other things to worry about right now.